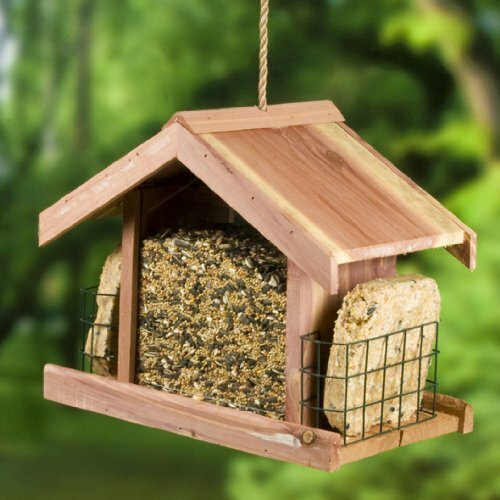 The Perky-Pet wooden bird feeder is made of non-endangered cedar wood. It is water resistant and made with insect repellent to prevent wood damage. Design is rugged and will stand firm against the weather. This bird feeder is made with a 5-Pound capacity seed reservoir, and two suet cake holders, one on each side. Seed reservoir is transparent so you can always see the seed level, and know when to refill, and suet holders are made of steel. This allows you to attract a large variety of birds at once. Like cardinals, finches, woodpeckers. There is a wooden roof on the top that give good protection from rain. You hang the feeder by the hole of the roof, it comes with a rope, but you can change it for a chain of some kind, as squirrels can chew on it. It can be pole mounted if desired as a second option. The most popular is the black oil sunflower seed, it will attract smaller birds like sparrow, junco and goldfinch, it is accepted by the large variety of backyard birds. You can use mixed seed if desired, if you buy mixed product make sure it contains white proso millet. This seed is liked by many birds, as well as cracked corn. You can use it for Nyjer seed, however you must check the Nyjer as it can get moldy, this is from lack of air circulation in the feeder. Clean the feeder on regular basis to prevent this. Are this Wooden Bird feeders squirrels proof? This hopper bird feeder is not squirrels proof, first of all as I have mentioned before it is made of wood, also the two suet holders are easily accessed by the squirrels. If the squirrel can get on the feeders suet will be eaten fast. To prevent this it is best to provide additional squirrel protection, placing it away from grounds, and buying a squirrel baffle that can be mounted on top. Or if you install it on the pole, than place a squirrel baffle at the bottom so squirrels cannot climb. The suet holders look like in the right conditions the bird might try to enter the holder when suet is getting eaten and becomes smaller. In that case the birds can get stuck or hurt when trying to get out. I have found one review where that happened, and the bird had to be released. But it looks like most of the people don’t have this problem. There is also a small opening at the top where the roof and the seed reservoir meet, small bird can possibly enter the feeder from that opening. One user reported this happening, the bird was fine. I have researched and come to conclusion that it is isolated case. Remove old seed out of the feeder, then wash it with soap and warm water/bleach solution. You can soak the bird feeder in the water, scrub it with a brush, and dry. Remove all old seed and hulls, make sure bird droppings are cleaned. Wash your hands after each feeder cleaning. The roof just lifts off easily for refilling. The plexiglass is removable. You never want the seeds to stay to long in the feeder, as it can get bad, and birds can get sick, change it if it is not eaten. This bird feeder can be hanged or pole mounted. It comes with a rope that extends from the roof, but it is best to replace it with a chain, as squirrels can easily chew on it. Some additional squirrel protection is advised they can easily access the suet cakes if they jump on the feeder. And the wood can be chewed by them also. You will have to provide extra protection like a squirrel baffle. By adding a water source, you also can attract a larger variety of birds to your yard. You may even attract more colorful birds that don't eat seed, but are in need of water! Check Perky-Pet 50144 Deluxe Chalet Cedar Feeder, 5-Pound Capacity here.